The Trap (Whatever Happened To Our Dream Of Freedom? ), from Sun 11 March, BBC2, 9pm. Power of Nightmares' Adam Curtis is back with a new polemic. This time pretty much everything out there takes a pasting. Posted: Thu Mar 01, 2007 2:52 pm Post subject: attack on Iran? The BBC have been messing Adam around, altering and delaying this series after the success of The Power of Nightmares. I know from a mutual friend that Adam finds the heavy supervision imposed on his filmmaking by the BBC patronising and irritating. Even though he's just about the most award winning documentary maker in the world the BBC managers and commissioning editors (some of whom came into the BBC as accountants!) Still think they know how to make documentaries better than him. What a bunch of silly chaps and chapesses these lame excuses for media managers are and ... isn't their mock idiocy handy for the Zionist push to bring British public opinion into line ready for an attack on Iran? Cold Cold Heart is the title of an upcoming documentary series originally scheduled to be aired in Autumn 2006 by British filmmaker Adam Curtis, well known for other documentaries including The Century of the Self and The Power of Nightmares. The films were not however broadcast as announced and remain unaired. According to the BBC announcement for the Autumn lineup, the series will consist of three 1-hour films exploring "the death of altruism and the collapse of trust – trust in politicians, trust in institutions and trust in ourselves, both in our minds and our bodies." Altruısm ıs a myth ınvented by socıalısts. We are not on thıs board for altruıstıc reasons - any of us. We are here to shıll or because we want a just socıety of because we lıke dıggıng ın the dırt or because we lıke the company. Apparent altruısm ın nature always has an ülterıor motıve and the elıte know thıs. I could mention lots but just for starters how do you explain the Royal National Lifeboat Institution? Please explain why so many have given their lives attempting to rescue total strangers. rodin, why are there no dots on top of your i's? Fighting for a just society is a largely altruistic endeavour. Contrary to what you might believe, modern Darwinists do believe that humans are naturally predisposed to behave altruistically as well as selfishly - life is not a zero sum game. "Freedom is the freedom to say that two plus two make four. If that is granted, all else follows." Is it just me, or is Rodin scary? Get your videos and DVD recorders ready as this will almost certainly never be released on DVD just as Curtis' past BAFTA award winning documentaries haven't. "Human beings will always betray you. You can only trust the numbers." This chilling declaration flashes up in the opening credits of The Trap: What Happened To Our Dream Of Freedom, a new documentary series by Adam Curtis which starts on BBC2 next week. Curtis is best known for his 2004 series The Power of Nightmares: The Rise Of The Politics of Fear. This detailed how neocons in the US talked up the threat of radical Islamism to justify their "war on terror". The Trap is even more ambitious in scope. Like The Power Of Nightmares, it uses archive footage and interviews to explore the history and political impact of an idea – in this case the model of "individual freedom" that underlies neoliberal economics. Curtis traces the roots of this idea to the early post war years, when a circle of right wing thinkers – followers of the Austrian economist Friedrich von Hayek – became influential in shaping US nuclear strategy during the Cold War. These researchers, including the mathematician John Nash, gathered at the Rand Corporation in California. They developed "game theory" to model what a "rational" military strategy would be in the face of threatened mutual nuclear annihilation. These games imagined a paranoid world where individuals ruthlessly sought rewards and modified their behaviour in the light of that of their opponents. Crucially, this behaviour could be measured "objectively", allowing researchers to create computerised models and calculate "optimal" strategies. Curtis’s documentary traces how its underlying vision of social behaviour was picked up and generalised to areas such as psychology, economics and management theory. The political crisis of the 1970s offered the chance for the followers of Hayek to take centre stage. They attacked notions of a "public service ethos" in state controlled institutions, arguing that public sector workers were motivated purely by self-interest – just like the "lonely robots" of their computer models. Private sector management techniques were imported into public services, displacing previous attitudes with performance indicators, targets and incentives. This, it was claimed, would remove "inefficiencies" and induce "rational" behaviour into sluggish bureaucracies. Curtis notes that while this project started in the 1980s with Margaret Thatcher’s introduction of the "internal market" into the NHS, it really took off under John Major’s government – and has been ruthlessly expanded under New Labour. But far from "rationalising" public services, this battery of statistics had the opposite effect. Public sector managers started to "game the system" – fiddle the figures by reorganising services to artificially meet targets. Curtis cites examples from the health service, education and policing. In one instance, hospital managers took the wheels off trolleys and reclassified them as "beds" in order to hit their target of reducing the number of patients on trolleys. New Labour’s response to this madness was to create even more targets in a futile effort to balance out the distortions produced by the system. Public services were plunged into a nightmare world of metrics, audits and meaningless jargon – what Curtis calls the "tyranny of objective numbers". The results of this shift have been disastrous, Curtis argues – and even some of the original founders of game theory, such as John Nash, now agree. Far from bringing "freedom" from bureaucracy, neoliberal management policies have increased social inequality, plunged the poorest in society into misery, and fuelled the rampant concentration of wealth in the hands of a new super elite. Under New Labour social mobility has declined to the lowest levels since the Second World War. Curtis narrates his story by splicing together archive footage of news events, social situations, even clips from television dramas and films. It’s a compelling and original style that places his work somewhere between a documentary, an essay and a dream. However, it has limitations. Watching The Trap one can’t help feeling drawn into the paranoid world of the Rand Corporation theorists. While Curtis expertly traces the development of their ideas, he is silent when it comes to explaining why those ideas took hold. There is no sense of any kind of alternative vision, nor any pointers to a solution. Episodes such as the rise of Margaret Thatcher just "happen", with the immense political conflicts of that period relegated to a footnote. Rather than seeing ideas as being consciously promoted by particular social forces, Curtis paints a world where we all just sleepwalk into oblivion. Nevertheless, Curtis’s work is gripping and thought provoking. His documentaries are proof that television can deal with complex issues without being patronising. The final programme in the three part series – still in preparation as Socialist Worker went to press – examines the "war on terror" as an attempt by neoliberals to extend their deranged vision of "individual freedom" by force. If the first two episodes are anything to go by, The Trap is a strong contender for "must see" documentary of the year. This in a nutshell are what notions of freedom in the West. Slavery. If one has enought slaves to cater for the needs of the debt laden junkie consumer whether it is a house maid, a child making branded clothes, zero interest deal on that new sofa etc. makes us ...free. ID cards, tracking at work with microchips, unlimited power to managers under the philosophy of 'empowerment', monopoly status for most companies equals both individual 'choice' and an open prison environment worthy of a Primo Levi character in I am a Man. What binds it all in place is the fear of 'terrorism' and the demand for ever more policing for the greater good. If none of the above issues are analysed it wont even start to touch the thorny issue of freedom. Adam Curtis, de maker van de must see documentaireserieThe Power of Nightmares heeft een nieuwe serie op de BBC: The Trap: What Happened to Our Dreams of Freedom. Posted: Tue Mar 27, 2007 1:50 pm Post subject: The Trap, All 3 Episodes here! Digg it aswell, people need to see this! What do others think of this programme? I thought it was interesting but a must-see? Not so sure. Lots of interesting stuff but Curtis's interpretation of the Neo Cons/Blairs motives was as daft as they come. Blair writing to Isiah Berlin to ask if his idea of negative democracy could be tweaked to suit Blair's agenda showed not only Blairs lack of undestanding of Berlins ideas but his desperation to rationalise the events to come. The idea that Bremmer was put into Iraq to foster this "negative democracy" was laughable. Curtis was asked on a BBC board re The Power of Nightmares if he thought it possible the Neo Cons could have been behind 911 - he answered No. No qualifications to the question which by its nature demands it. "Do you believe it possible that the American Neo-Cons engineered the 9/11 atrocity as a catalyst for their program?" We might expect too much but from someone like Curtis I expect a well argued case - much of the latest was far from it IMO. i thought the series connected alot of dots, some erroneously. a must see? perhaps not, but worth seeing definitely. plenty to think about and alot of good information that's rarely publicised or discussed. 9/11 was an Inside Job, it would be commercial suicide for everything else. That is clear beyond a doubt. He does show that the invasions in the 1980's and their justifications by the Reagan regime were similar to Blairs justification for going to war in Iran. If we are around 15 years behind America in everything, our Iran-Contra scandal must be coming soon. Unless a new war intervenes and it is put on hold. I agree Brian. How he portrayed negative liberty and unquestioningly accepting that Kissinger or Reagan or neo-cons or Bush or Blair were genuine in their protestations that they were/are fighting for negative liberty or any kind of liberty or justice was deeply misleading bs. I hadn't come across the concept of negative liberty before seeing the programme but I understood what Issiah Berlin was saying. Tony Blair is no revolutionary or (negative) libertarian. If you saw the first two films of Adam Curtis’s three-part BBC series The Trap: What Happened to Our Dream of Freedom?, and have felt intrigued, thrilled, infuriated, challenged or simply engaged, then do make a point of catching the third film showing on BBC2 this Sunday. Because you ain’t seen nothing yet. In the meantime, along with the usual plaudits Curtis has been receiving a bit of flak. I blame the conspiracy theorists. Their paranoid fantasies do make it difficult for serious folk who want to point out that there is indeed more to the world than surface appearances. Unfortunately, anyone who makes the noble effort to do that or to pull together some clues and connections from our history to explain our present sorry state runs the risk of being called mad. Sure enough, when confronted with The Trap several commentators – for example, in the Sunday Telegraph, Financial Times, New Statesman, Guardian and Sunday Times – promptly fell right into it, and reached for the ‘conspiracy theorist’ label. My conspiracy theory is that they all dine in the same restaurant. The thesis of the series is quite straightforward. It is in fact stated clearly and often, and it is patently not a conspiracy theory. It is that we live today within a conception of freedom and of ourselves that is narrow and limiting. It is an ideology that developed first in the Cold War and went on to be embraced by sections of both the right and left, and is today promoted by the likes of US President George W Bush and British Prime Minister Tony Blair. It found expression in many quarters, in the economic philosophy of FA Hayek, the anti-psychiatry of RD Laing, the negative liberty of Isaiah Berlin, the public choice theory of James Buchanan – and that is just for starters. It is an ideology which views human beings as selfish, mistrustful, isolated individuals who are seen, and have come to see themselves, as simplistic beings who can be understood and directed through the application of scientific techniques, especially through the application of mathematics, numbers and targets that can tell them what they are expected to achieve, what is normal and how they should feel. This diminished view of the self might have been of use in countering communist tyranny but it was a ‘trap’ and it has left us with ‘no positive vision in the face of all the reactionary forces’ that it has in fact helped to awaken around the world, says Curtis. Some of the arguments are undercooked, and some of the connections glib. Curtis has an uncanny feel for the problems and weaknesses of contemporary culture, and a terrific nose for their antecedents and adumbrations. The three films in The Trap, however, have a tendency to succumb to the teleology temptation, and accord far too prominent a role to the early expression of a current idée fixe in the matter of its actual development. To take one example. We can agree that the Cold War world saw the promotion of a suspicious, isolated individualism; that we are even more deeply in the thrall of such an outlook today; and that there are connections between the two. We should take care, however, not to read the later phenomenon as either the same as the former or determined by it. Indeed we should take care not to take the Cold War stand-off itself at face value. It should be said at once that there is so much fascinating material in these films, and indeed so much real sense too, and the whole is delivered with such vigour and panache, as to more than compensate for the strains in the thesis. The fact is that there are simply more ideas, more images, more provocations, more jokes, more great music in one Curtis documentary than in a month of your average ‘current affairs’ programmes. ‘What I am trying to show is how this ideology has permeated not just politics. I am pulling together ideas from many different areas. They are inter-related and they are all about politics in the wider sense. What I do is modern political journalism. So much political journalism is moribund because it simply tries to follow power down the traditional circuits. Power today is travelling much less in the political sphere and much more in the culture generally; in the management culture, in mathematics, in genetics, in science, in psychology. Power deals with people much more directly now. Curtis’s films do not in fact work just at the level of collage, elegant and powerful though that is. That would underestimate the force of the earnest, steady, authoritative, voiceover argument from Curtis himself. This is the unnerving counterpoint to the dazzling sequence of images and sounds that unfold from the screen. He does not mystify. Indeed he simplifies and repeats. He drives remorselessly on, challenging us to keep up – with the ideas, the images, the sounds. It is total TV. Where to next with his own work? ‘I’m not telling, but I will say that there are big changes afoot. I’ve come to the end of something. The Trap was itself the third in a series. There was The Century of the Self, The Power of Nightmares [his much discussed film on the myth of an all-powerful al-Qaeda], and then The Trap. Actually, they could have been called The Century of the Self, The Enemies of the Self, the Death of the Self…. How does he see things developing in the world at large? ‘I am optimistic. There are, of course, things that get me down. One thing that continually depresses me is the way that we got to the moon and no further. We just stopped trying. We are more interested today in our obsessive compulsive disorders or whatever. Unhappiness, despair, anger – these are being ironed out of people. They are being turned into medicated zombies. ‘But not all people are like that. The ghost that haunts the system is that of the secretaries at the Rand Corporation in 1956 who were given a game to play and expected to act selfishly - they proceeded to ignore the script and acted co-operatively instead. With a typically sly flourish, he gives it to Alexander Haig, the US secretary of state to Ronald Reagan, to assert that: ‘There are things that we Americans must be willing to fight for. You know, this republic was spawned by armed conflict. The freedoms and liberties that we enjoy today were a consequence of armed conflict, insurrection if you will.’ Haig might have added that similar developments occurred in England, and it didn’t all end in tears there either. John Fitzpatrick is director of the Kent Law Clinic at the University of Kent. The final part of Adam Curtis’s The Trap: What Happened to Our Dream of Freedom? will be shown on Sunday 25 March. How he portrayed negative liberty and unquestioningly accepting that Kissinger or Reagan or neo-cons or Bush or Blair were genuine in their protestations that they were/are fighting for negative liberty or any kind of liberty or justice was deeply misleading bs. The problem with applying game theory to real life is that unless the players know the rules of the game they will find their own way through the game. How many times have you started to play a game with people only to find that they have either a different understanding of a rule or a completely different set of rules even though the game is still overall recognisable? This is where "game theory" overlooks human individuality. As to the programme itself....I felt it was interesting on one level. There were many missing layers to the story...such as the experimentation of Ewan Cameron and MKULTRA experiments, Tavistock research, exposure of the Duplessis Orphan outrage etc.....it's as if the BBC decided to show the naughty boys..while the real badasses like Ewan Cameron never got a mention. It could be argued that these issues were outwith the scope of the programmes remit but surely when critiquing the subject of psychiatry these subjects are very valid. Ultimately that is what these institutes were about...social and perception control. Our dreams do not fit in their ballot boxes!! The Center for Gaming promotes the use of games in research to improve decision-making across a wide range of policy areas. The Center supports the innovative application of gaming, the development of new gaming tools and techniques, and the evolution of existing forms and methods. A "game" can be thought of as any interactive process with five basic characteristics: (1) multiple independent decision-makers, who (2) compete to achieve goals, (3) in evolving contexts that change according to their interactions; (4) which are governed by a set of rules; and (5) the results of the interactions do not directly impact on the state of the world. The question "What are games good for?" can most easily be answered by a stroll through the toy department at any local department store. The shelves are full of games of business and conquest, of war and diplomacy, of crime, education, dating and marriage, of life and death. Similarly, "serious games" have been used—at RAND and elsewhere—to explore issues ranging from urban planning, climate change, drug policy, and disaster response, to nuclear proliferation, and of course, military operations and warfare. Nobel-prize-winning economist and RAND alumnus Thomas Schelling put the value of gaming quite succinctly when he wrote that alternative approaches to strategic analysis can fall short because no-one can “make a list of things you never thought of.” Games create opportunities to think of things you wouldn’t otherwise. "One thing a person cannot do, no matter how rigorous his analysis or heroic his imagination, is to draw up a list of things that would never occur to him"
Games can be used at various points in an analytic process to achieve different objectives. At the outset, games can help to make sense of poorly understood problems and identify hypotheses to be tested. Gaming can also be used for experimentation, to test concepts and plans and to explore the problem space. Finally, at the end of the research process, games can be used to assess whether findings can survive contact with human decisionmakers. Because games offer a visceral first-hand experience, they are also powerful tools for training or educating players. They can spark communication and collaboration among people who otherwise would never see the benefits of interacting, or would lack a compelling opportunity to do so. Army airborne forces are unique in their ability to quickly deploy worldwide from the continental United States via transport aircraft, including to objectives that may be deep inland and generally beyond the reach of maritime forces. Examples of this type of mission include quick-response efforts to seize and secure weapons of mass destruction, to protect an enclave, or to prevent genocide. A RAND project focused on the pivotal role that airborne forces could play in key missions in the future—particularly against hybrid threats and in anti-access environments. In the future, airborne forces will likely be confronted with increasingly sophisticated anti-access threats, and improved tactical combat capabilities in the hands of potential opponents. To overcome these new threats, the airborne force will need new capabilities. A very important consideration in this research was the need to identify potential enhancements to today’s airborne forces that could be made in the next three to five years. The research team identified the concept of enhancing today’s airborne forces by adding a light armored infantry that could be airdropped by parachute or air-landed at an airfield. Such a capability provides airborne forces with increased speed and mobility once it arrives in the objective area, as well as greater survivability and firepower. After developing the initial concept, the research team conducted extensive analyses of vehicle options, as well as the airlift requirements that such a concept would generate. An important part of this analysis was a series of tabletop exercises conducted with subject-matter experts to explore how such a concept could be employed in a variety of scenarios. The RAND Corporation has been at the forefront of gaming for nearly seven decades. 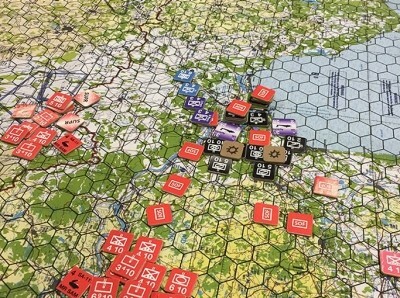 In the 1950s it pioneered the use of political-military crisis games to study nuclear deterrence. The idea for the U.S.-Soviet "hot line"—the famous "red telephone" that allowed the American president and his Soviet counterpart to communicate directly and securely in a time of crisis—grew out of a 1961 RAND game. During the 1990s it developed the innovative "Day After" approach to explore the consequences of nuclear proliferation, and the platform has subsequently been used for topics as diverse as global warming and cybercrime. Among other topics, RAND is currently using gaming to examine impending changes in national health-insurance regulations, key issues in U.S. national security strategy around the world, and political transformation in volatile regions.